Yesterday Tom Pickett from www.tpickettphotography.com began to explore the topic of External Flash Units. Once you’ve read part 1 continue reading the second part of the External Flash Unit series below. Now let’s talk a little about fill flash. Fill flash is when you are outdoors for example and the light you are getting from the sun is the main light. Fill flash is just that. Flash that fills in the shadows caused by the bright sun (like those rabbit eyes) on people. Let’s take a situation. You learned from someone to place people in the shade on bright sunny days. So you have found some shade but there is some strong backlight in the background. You take a shot without the flash on and discover that the backlight has caused your camera to read the backlight, expose for it (and not the subject) and guess what happens? The subject becomes a silhouette. That’s nice if you wanted to make the subject a silhouette but in most cases that is not nice if the subject looks and says, “how come I cannot see me”. Answer? Fill flash. You turn on the flash, focus on the subject. The camera’s light sensor reads all the light, ambient, background etc. Then, you take the shot again. This time the flash fires just the right amount of light to “fill-in” the subject with the flash produced light. Now you have a rather nice shot where you can see the subject and the background. That’s not all. The sensors in the camera automatically tell it to look at the backlight, read the value and then the camera tells the flash to produce that amount of light less 1.2 to 1.4 stops below the background light. This algorithm is built in and is automatically done for you. This feature allows the shot to look more natural since we found out long time ago that if you tell the flash to produce the same light value, the result is a “fake” looking photograph. We all should write the manufacturers engineers and thank them for this feature. But wait. There is more. Let’s now say that the backlight is strong…very strong. What will happen with that? The answer lies in your camera in what are called custom functions. You simply go to your custom function menu and find the one that says “auto reduction of fill-flash” and turn it OFF. (It is always on until you turn in off). The result is the flash puts out a full burst and is no longer reduced. Result? Another properly lighted shot! For those of you lucky enough to have purchased a high-end flash unit such as the Canon 580, you can also pump up the light output directly on the back of the flash unit to increase the duration thereby yielding the same result of turning off the auto reduction in the previous paragraph. You can also tell your camera to instruct the flash to give you more output. This is covered in your manual and is called flash-compensation. You can increase or decrease the amount of flash by using the camera’s built in flash compensation by as much as two f-stops of light either way…up or down. Consult your manual as it differs from manufacturer to manufacturer. Let’s talk about “dragging the shutter”. You saw me mention that above and you thought what is that? Dragging the shutter sounds awful, damaging doesn’t it. Well not really. It is a little trick that once you learn how to do it, you will always use it in situations that come up….and I can assure you they come up. Set up the situation here…you are photographing a wedding inside a dimly lit church. You have your flash to take the photos. But you notice that the altar, which is dimly lit, is not being picked up by your exposures. Your subjects are. The answer is to revert to using very slow shutter speeds. Since your main light is your flash, the ambient light around the altar is not being lit by the flash. But if you lower your shutter speed to say 1/15 or even 1/10 and then take the same shot, magically the camera picks up the ambient light around the altar. But let me warn you here that at this point you must use a tripod for this since at these shutter speeds, any movement of the camera by you (you cannot hand-hold a DSLR using 1/10 sec shutter speed) will result in very blurry altars. Buy yourself a nice tripod and try this. It really makes a nice effect. So now you know what “dragging the shutter” means….you have dragged it down to slow speed shooting. Many of you have e-mailed DPS wanting to know more about high-speed sync in flash photography. As you probably know, most DSLR’s (and most any kind of SLR, digital or not) have a maximum flash sync speed. It is generally in the area of 1/200 shutter speed. Very few have lower, some slightly higher. To find yours, refer to your camera specifications in your owner’s manual. This sync speed is the maximum your hot shoe flash will sync and provide you with properly exposed images. But wait. There is a method to override the limits again thanks to the engineers. Sometimes, when you are outdoors and are shooting portraits you would like to shoot at F4 or even F5.6 to get that magic blurred out background which then lets your photo viewers focus on the subject, not all the trees and objects behind the subject. But when you put your camera in AV mode, dial in an aperture setting of F4, you find your camera wants to set a shutter speed of 1/1500 or more. Whoops! Flash won’t sync at that speed, right? Wrong! Every good DSLR should have an override custom function on it that allows shutter speeds exceeding the maximum sync speed set by the factory. It is there. Check your manual. On Canon units, it is in the “custom functions”. Once you have discovered how to override the max sync speed now you need to look at the back of your flash unit and you will find a mode called FP sync or just FP. On Canon units, it is a little lightning icon followed by the letter H. When you slide the switch or otherwise get it to this mode, a little lightning icon will appear in the viewfinder. Now, you can go ahead and shoot at F4 with shutter speeds up to the max the camera has available. And you still achieve that precious look that we all want; a portrait with a blurred background. Finally, let us take a look at another valuable feature that is often never used but once you learn how to use it, you will never forget it. I am referring to the FE (Flash Exposure) lock feature found on most cameras. FE lock is simply obtaining a proper flash exposure, pushing the right button to lock in that exposure. You then have about 16 seconds to recompose and take the shot thereby guaranteeing the exposure you set and not have the camera reset a new exposure ruining your shot. I use this feature very often especially at weddings where you expose and lock the exposure then recompose and take the shot. You locked the exposure hopefully on the brides face or the grooms face then recomposed. The result will be perfectly exposed faces or dresses or whatever you locked in from the start. There is nothing worse than a shot of a $5,000.00 wedding dress with all the highlights overexposed. On Canon units, the FE lock is the asterisk button (*) directly below the display screen on top of the camera. To make this work, use the partial metering mode (or spot metering mode) over the subject where you want to lock the flash output then press the asterisk (*) button. The speedlight will pre-flash that area and lock that exposure into memory. I might caution you that you have 16 seconds to then recompose and take the shot. If you find you need more time just press the (*) again and again until you feel comfortable with the composition. Each time you press the (*) button the unit will fire another pre-flash. If you use this, remind your subjects that they will see two flashes. I tell them that the first flash is me telling the camera what to do. Then when I am ready to take the shot with the second real flash, I warn them that now comes the real shot and flash. This way, you avoid them thinking the shot was taken with the “pre-flash” then moving. Incidentally, this also works with the built-in flash unit on all Canon DSLR’s! In closing, let me tell you about an accessory you should add to your arsenal as soon as you can for your speedlight. This is called an off-camera flash cord. It is expensive (about $65.00US) but is worth it. It allows you to remove the flash off the hot shoe and hold it away from the camera and still maintain E-TTL operations. Moving the flash “off-shoe” allows you to get really creative with your flash unit. 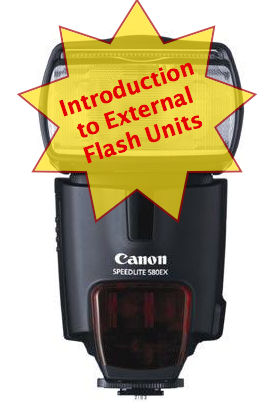 Frankly, I have just touched the surface here in this article on flash units for your DSLR. Many of us pros (including me) continue to use manual flash units to gain even greater control over lighting. But that is a whole new area that should be covered by itself. If you check out a Canon 550 or 580 unit, you will see that it does allow the user to set it to manual operation as well which backs up my statement that manual use of cameras and flash units is where we pros like to be….but for beginners and intermediates, I highly recommend the use of those geniuses at the factory that allow us to automate our shooting as much as possible. Good shooting to all of you. I came across this site by chance, and some have said already what good timing and a big thank you for the time taken to put all his expirience down for us to learn. Browsing and browsing and getting more confused. I ended up bidding on (YN-560EX YN560 EX TTL Wireless Flash Speedlight For Nikon) and now that i won the bid i wonder if this is a good choice !! ( is it Tom ?) i look forward to recieving it and trying it out by following the steps i reed and will read again once the unit arrives. I really hope all will be ok,!! Whilst staying gluded to this site. I wish to thank you once again. Thank you so much for this post. My husband just bought me my first flash and I was so very lost. You have really helped me understand so much! Thanks so much! I'm so grateful for this info! You don't even know how helpful this has been. I'm shooting inside a poorly lit church tomorrow and I feel so much better going into this, thanks! hi, ive had an external flash but not the canon for my eos 60, ivve got mine with Nissin Di622 mark II, i had tried to check the settings in the camera for the EV , and for the flash EV. however im not sure which one does do the command. is it the camera or the flash? one more, if i had my flash attached i dont see the AF point blink on my viewfinder when i press the shutter halfway, is this normal? Thank you for getting this article put together. I have been looking for some good info on using flash units to their full advantage. This article has taught me a lot. Again, Thank You. Thank you for an excellent article. You have managed to demistify the basics of flash photography for me. This is exactly what I was looking for, a sensible, well written articel to help me understand my flash. If you have the kindness please tell me if i can use an external flash unit such as 580ex ii to make some Chiaroscuro shoots in black&white. I know you to do that using additional lights but is there any technique to produce Chiaroscuro via an external flash unit ??? @ Chris: standard sync limits are based on one flash pulse per shutter release. High-speed sync uses several flash pulses to get around a problem caused by the way curtain shutters work. Most DSLRs have two curtains for the shutter. When you release the shutter, the curtain covering the sensor pulls back to allow light to hit the sensor. At lower speeds, the second curtain closes across the sensor to end the exposure only after the first curtain is fully open. For however long the shutter speed is, there's a slit between the two curtains of the full width of the sensor. The curtains can do this sequential dance only so fast, however. For high shutter speeds, the second curtain starts to close before the first one is fully open. This allows very high effective shutter speeds, with the slit between the two curtains narrowing as the speed increases. This causes a problem for the flash, though. The pulse of light emitted by the flash is of very short duration. At slow shutter speeds, this doesn't matter, because the entire sensor is exposed to the flash while the first curtain is open and before the second curtain starts to move across. At higher speeds, though, there is no one moment at which the entire sensor is open for exposure â€“ remember that the second curtain begins covering up the sensor before the first curtain has fully opened. Thus, when the flash fires, there will be a part of the sensor that is blocked off from the light and will appear black (or at least under exposed, depending on the exposure for ambient light). High-speed flash gets around this by firing a series of flash pulses throughout the time that the curtains are moving. No matter when a given part of the sensor is uncovered by the curtains, flash will hit it. I don't know for certain why high-speed sync is not enabled by default, but I imagine the reasons include: (1) that the effective flash intensity ("power" or duration, and range) must be lower in order to sustain multiple pulses and (2) that the flash may not be able to freeze high-speed action due to the longer effective duration of the pop. These would alter standard expectations and so one should have know that one wants them and choose to turn them on. I don't understand the difference between syncing it under 1/200 and overriding the function. If you can override the function of it, what is the point in syncing up to only 1/200. Therefore, there must be a downside or a caveat, which I'm hoping you will please explain? "I have no way to comprehend what some said about people not liking pre-flashâ€¦it is imperceptable. I would welcome more input via email from those who brought this subject to the table of discussionâ€¦thank you." I tried to e-mail you on the contact page of your website as you asked but received a message from Yahoo! that noted that â€œthis was not permitted from your URL.â€ I have no idea what that means so I thought I would communicate with you here. Thanks for inviting me to e-mail you to continue the discussion. Following-up from your flash article regarding preflash blinks. As mentioned I do notice an issue with some very sensitive subjects blinking in the Delta T between preflash and recording flash. As I noted in the article comment this is not because of red-eye reduction. I do not use red-eye reduction. The percentage is low but I would say one in 50 or so subjects will show some sensitivity to preflash. As noted I generally just go Manual in those situations and the problem is solved. I am not the only photographer that sees this problem. Several of my professional colleagues see this too. The issue is not related to a particular manufacturer. I too can see the dark zone between preflash and recording flash when I fire my cameras but I am not sensitive to the blinking issue. The duration is real and it is there to see. I might pick it up as being more obvious because I know what to look for but some subjects seem to have a sub-conscious â€œprotectionâ€ defense that causes them to blink in the duration. My wife leads the 4-H photography group locally and is soon to be doing a meeting on lighting and effects. I'm sure there is information here that could help. Thanks for the tips! I am just trying to glean tips as I may be taking pics at a friends wedding and don't want to do a totally terrible job. (Free doesn't mean that the photographer is totally free of responsibility). Nice article, one blog that I've found incredibly helpful for 'manual' flashes and techniques and goes into much more depth is www.strobist.com . Their lighting 101 course inspired me to get wireless triggers and an external flash, they really know their lighting. Thank you, thank you, thank you! I just got the 580 a couple months ago and was a bit intimidated, but now I'm looking forward to playing around and learning what it can do. Really appreciate it! Thanks for this article. So that's why the professionals are using their external flash even if they are outside with natural lights. Thanks to everyone who took time to respond. First, let me hand out accolades to Dane and Simon who both picked up on my error: 1/125@F8 is the same as 1/250@F5.6 not F4 as I stated. Hats off to you both for that. To the Kevinmonster....great thinking on your part that when flash is your main source of light, shutter speed is more or less irrelevant and can go all the way up to the cameras max sync speed but...you must be careful when you get below 1/25. At that point, the camera does start to see ambient light......see the article and read about "dragging the shutter". When I am shooting in a situation where flash is the main source of light, I use 1/60 or even 1/125 to keep out ambient light such as from flourescents, overheads etc. But sometimes you WANT the ambient light from say the altar at a wedding, that's when you go for slow shutter speeds at whatever aperture setting you chose. HarryPhillips is correct...the pre-flash was designed by the Canon engineers to happen in microseconds and the eye/brain combination sees the pre-flash and actual flash as one light. However, if you use the built in flash on any Canon unit.....it will emit a series of flashes...this is to eliminate red eye and also help the camera focus in dim light. But, again, this will not occur with hot shoe flashes such as the 480 or 580 series. I have no way to comprehend what some said about people not liking pre-flash...it is imperceptable. I would welcome more input via email from those who brought this subject to the table of discussion...thank you. To Kevin: Wow! I use wireless all the time. Pocket Wizards and such. But wait....do you have a Canon DSLR. You can go wireless and maintain ETTL function all the way with a Canon ST-E2 wireless infrared transmitter. Indoors, this thing will fire any Canon flash which you set on "slave". Outdoors, the unit becomes less useful as infrared goes out in all directions. Indoors, the signal does bounce off walls so the flash units can be anywhere you put them. Outdoors, the flashes have to be in a position to pick up the signal. If you have the older 550 or 420 flash units, you cannot use Pocket Wizards as they do not have a PC input which the Pocket Wizards need to fire the unit. However, the Pocket Wizards use radio RF to fire therefore they are much better outdoors. E-Mail me if you want to know more about wireless firing of flash. Usually, we only use the Pocket Wizards with strobes in the studio or on location. Perhaps I will include somewhere down the road how to use wireless flash and consequently cover how to set your aperture to strobes and or Canon's (or anyones) unit that has a manual mode.....such as the 580. I'd love to see a tutorial from someone that illustrates how to get an SB800 wireless without buying additional flashes. I totally agree that learning the flash is far more overwhelming than learning my camera! I've been trying to figure out all this flash stuff (including high sync flash fyi) for the past few months. I think it's more complicated than learning my 5D and that's a never ending process. Your article has been so appreciated and informative. Thanks so much for putting your time into this and en"light"ening us struggling stobists. Tom, good write-up! I knew a lot about external flashes already, but not the fine details you wrote about (e.g., fill flash algorithms that read backlighting, etc.). Well worth the read. This series gave a lot of answers I've been trying to figure out about flashes. It'll help me a lot when I go to look at the features I'm looking for! Good read! I moving into the area of external light and this is quite intresting! I was wondering if anyone had a link (not the strobist) to something like "manual flash for dummies" or something because i could really use that, i used to shooting with my SB 600 on TTL, and its great yes, but i m not getting those shots with the flash that i want which pisses me of (excuse my language)because the TTL keeps on doing what i dont want it to do! Lets go manual on this if not i will use trial and error! However, I'm interested to know if you could possibly produce an article on off-camera "manual" flash. I am trying to get into setting up off camera flash via pocket wizards and of course, that doesn't allow you to use TTL. Please let me know if this is something you can work out.